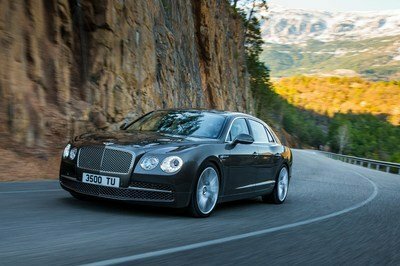 On the year of its 100th anniversary, Bentley started previewing the third generation Bentley Flying Spur (the second to omit the ’Continental’ moniker from its name in a bid from Bentley to move the car a bit away from the Continental GT’s performance orientation and keep it as a more relaxed offering in the minds of the clientele). It’s one that’s been somewhat overdue since the second-generation model has been around for six years already. Indeed, the third-generation Continental GT, which will basically lend most of its design cues to the four-door Flying Spur, was unveiled 24 months ago and only now are we seeing the second preview for the new generation. What are we seeing exactly? Well, not much but the detail is impressive in and of itself: the retracting and illuminated Flying B on the hood. Now, let’s first talk about what we see. The video is just 31 seconds long, and in it, without any distraction from a musical backdrop of some sort, we see the retracting ornament revealing itself from its hiding place behind the front fascia. What is interesting about the ornament is that it’s been redesigned. Now, the opened wings are no more connected fully to the B and the lower part of the angled letter is left open. The wings themselves are illuminated from the inside whereas before the ornament was one single element without any other tricks up its sleeve. The video’s description is boastful, to say the least with Bentley claiming that it’s innovating "beyond the existing boundaries of performance, refinement. and luxury." While Rolls-Royce will surely have something to say about that, it means anyway that the new ’four-door grand tourer’ aims to raise the bar much further than its predecessor did. With the video done and dusted, we can move on to the land of hopes and dreams otherwise known as the part where we discuss what the new Flying Spur should offer to not find itself lagging behind whatever Roller will have to offer in the new Ghost. For starters, let’s talk about visuals. The previous two Flying Spurs (the second designed by Luc Donckerwolke) were both rather round cars complete with circular headlights and taillights with rounded out corners. The third-generation model retains the roundness in the front and rear light clusters, but it gains the much more muscular and broader appearance of the current Continental that is, undoubtedly, a more boxy car. Happily, we don’t have to use our imagination too much to envision how the new Flying Spur will look like, because it was caught rolling around and about virtually without any sort of camouflage. 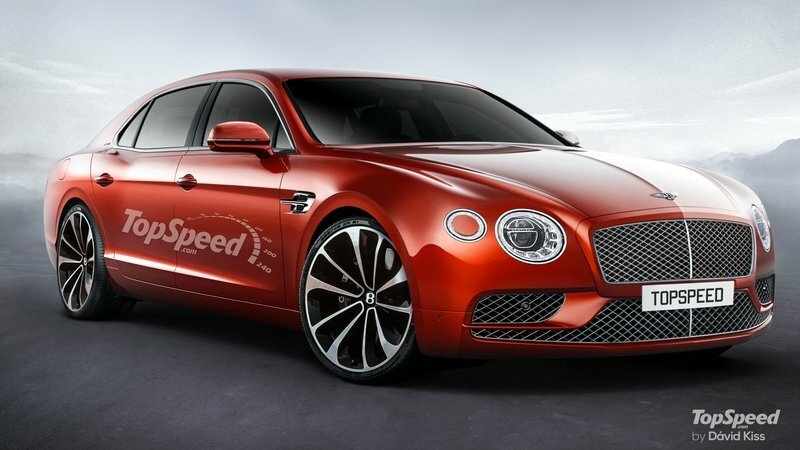 We showed you a render of the 2020 Flying Spur almost a year ago when we heard that the Flying Spur will become, along with its Continental GT brethren, the final non-electrified Bentley and also the last to sport this design language (although the language itself is as new as the latest Continental GT so that may not be true). We guessed that it would have a slightly different lower grille than the Continental GT while the main grille that sits on the plunging nose is virtually a copy-and-paste job from the GT. 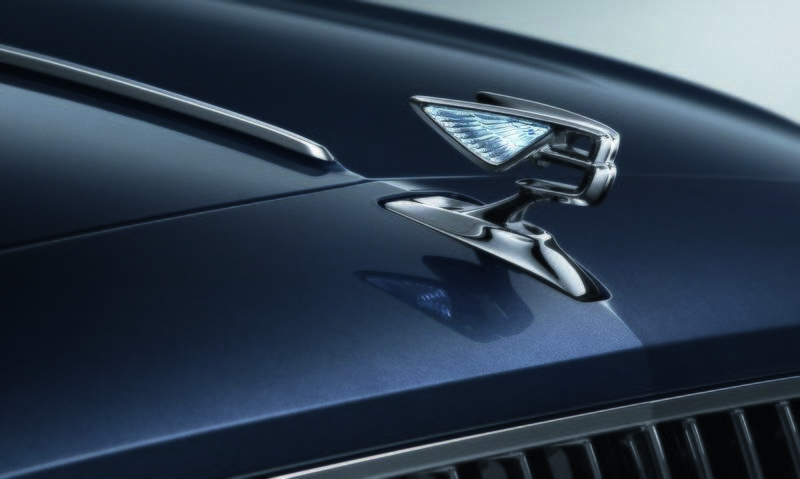 If the two-door model features two separated air vents on either side of the lower one in the middle (which is where the fog lamps are located), on the Flying Spur the main lower grille goes down and below the two side grilles that are separated merely by a reversed L-shaped bar. This is about the only detail that sets the two models apart as the quad headlights (with the outboard ones smaller in size) are the same. That and the name. If you’re a history buff, you probably know already that, according to Bentley, the car "owes its name to coachbuilders H.J. Mulliner, whose inspired idea to offer a four-door body on the Continental chassis created the Continental Flying Spur in 1957." In the rear, the Flying Spur is, however, a lot different. It features large, almost rectangular, taillights positioned in the upper corners of the fascia. This is more of an evolution of the taillights of the previous generation model that have been aptly copied by the Russian Aurus Senat sedan we talked about recently. These new lights, to me, look closer to the ones seen on the first Flying Spur and the first and second-generation Continental GTs. The current Continental GT, meanwhile, sports those slightly off-beat teardrop-shaped rear light clusters that look awfully diminutive on that broad rear fascia. 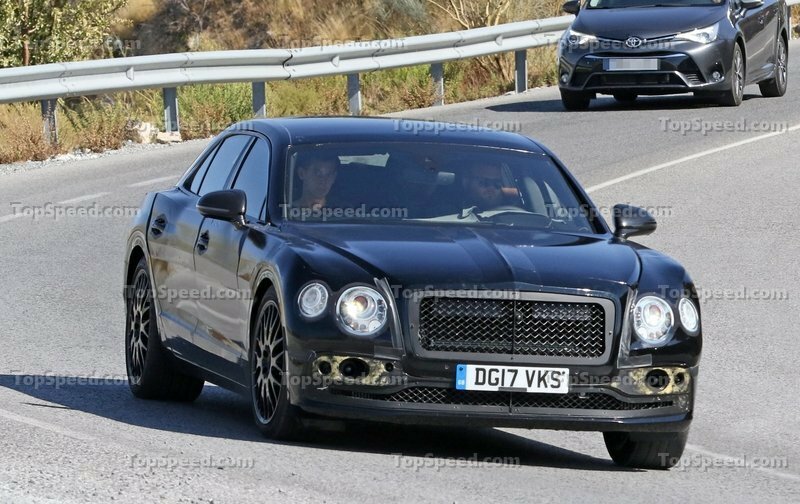 This change in style for the Flying Spur will bring somewhat closer to the Ghost, but the Bentley still has a lower-slung look to it with a lower hood and trunk line, with the same swooping line in the back set to remain. While we haven’t seen the new Ghost exposed, by the look of the highly camouflaged mules, I reckon Rolls-Royce will continue to offer a bricky sedan as its sub-Phantom offering. 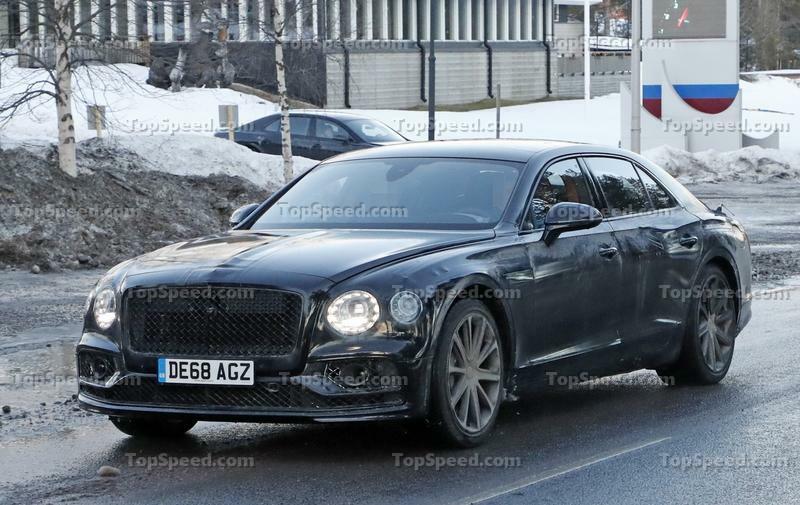 Looking under the skin, the 2020 Flying Spur should get similar engines to the current one so expect a V-8 and a W-12 in there for good measure and added refinement. 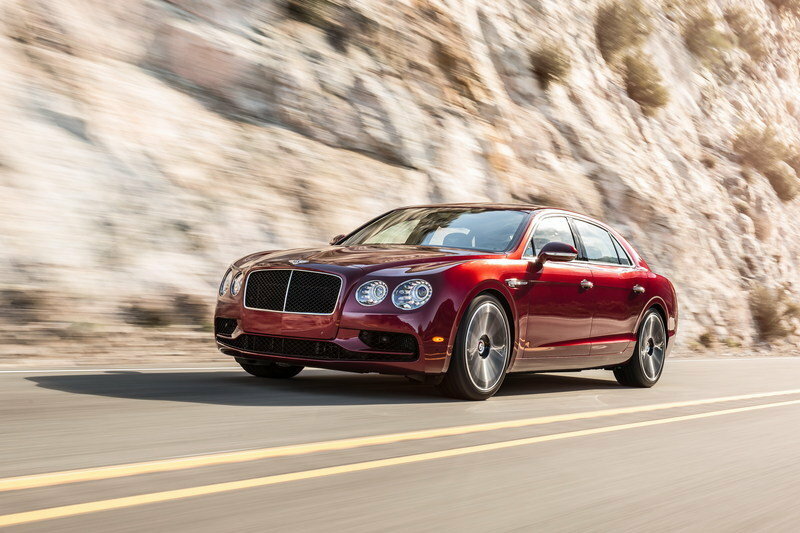 Currently, there are four types of Flying Spur out there: the traditional W-12, the V-8, the W-12 S, and, lastly, the V-8 S. The standard W-12 is a twin-turbocharged, 6.0-liter unit mated to a ZF-supplied eight-speed automatic that’s better left to do the job on its own due to the awkward positioning of the flappy paddles behind the broad steering wheel (a smaller three-spoke wheel is also available, but the paddles aren’t repositioned so it doesn’t really make much of a difference). The W-12 puts out 616 horsepower at 6,000 rpm while max torque, which is 590 pound-feet, is available from just 2,000 rpm and you know what this means. It means that this 5,610-pound car (about 300 pounds heavier than the outgoing Ghost SWB) can go from naught to 62 mph in 4.3 seconds and can do the quarter-mile in 13 seconds flat en route to a top speed of 200 mph (which the Ferrari F430 couldn’t achieve officially). The Flying Spur V-8, introduced in 2015, delivers 500 horsepower at 6,000 rpm and 488 pound-feet of torque at just 1,750 rpm from an Audi-derived 4.0-liter, turbocharged V-8. Both engines received a new ECU over the first-generation Flying Spur and, in my reckoning, something along these lines will happen again as the emission laws are getting tougher by the day and efficiency is the name of the game. The main difference between the first Flying Spur, named Continental Flying Spur, and the second one was the philosophy behind them. As I mentioned before, Bentley realized that its core market does not really want a four-door Continental GT that they can drive themselves. Instead, they wish for a more serene luxury sedan in which they can be chauffeured in, albeit one that looks less blocky than a Rolls-Royce. You may think otherwise, but the fact of the matter is that over half of the people that buy Flying Spurs come from China and Chinese customers like their cars nice and soft. 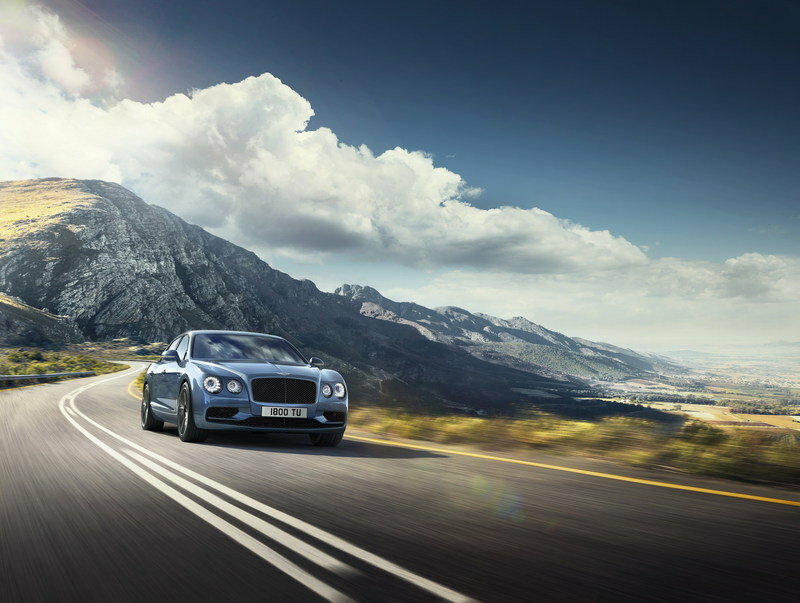 The second-gen Flying Spur features 25% softer bushing and also softer spring rates and anti-roll bars by 10 to 15%. Expect the trend to continue with the new model as a Bentley that’s too stiff will just divert customers towards the nearest Rolls-Royce dealership that’s known for not caring about stiffness or any semblance of sporty nature - although you can’t call a Ghost sluggish with its 562 horsepower and 575 torques via a 6.6-liter, twin-turbocharged V-12. The Ghost is 0.4 seconds slower to 62 mph than the Flying Spur, but you won't worry about this if you're in the market for such cars. The big thing Bentley is probably keeping in mind right now, though, is not engine-related nor is it gearbox-related (Rolls-Royce also employs a six-speed unit) but it’s got to do with the chassis. That’s because the new Ghost is finally getting a bespoke aluminum chassis and moves away from the steel monocoque shared with the BMW 7 Series. With aluminum being lighter, the whole car will be lighter and also stiffer all at once. 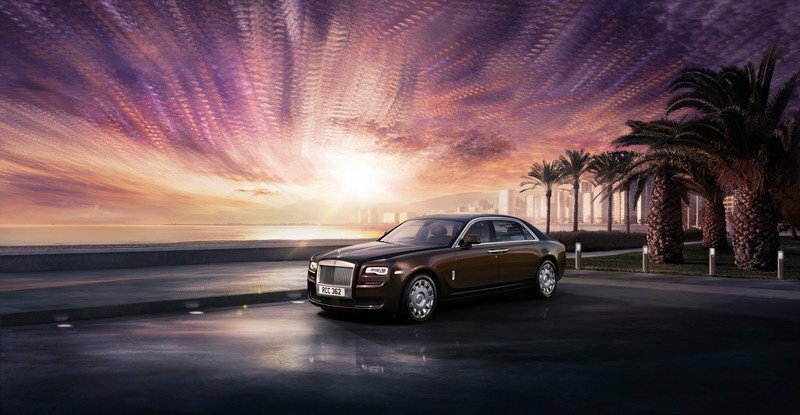 According to Autocar, the new Ghost is getting a "6.6-liter, twin-turbocharged V-12 developed to Rolls-Royce’s own specifications by BMW. That engine develops 577 horsepower and 626 pound-feet of torque in the range-topping BMW M760Li xDrive, but sources suggest it could produce more in the new Rolls-Royce." Meanwhile, inside the VAG Group, there is some potential sharing scheme in the making too. We've seen the first Flying Spur mules sport Panamera bodies and this got us thinking about what may lay underneath. The current Audi-sourced V-8, for instance, could be sidelined and, in its place, a 4.0-liter, turbocharged V-8 as seen in the Panamera could fill the void. In the Panamera, this mill churns out 550 horsepower and 567 pound-feet - 50 horsepower and almost 90 torques over what the standard V-8 can do and almost 30 ponies over what the V-8 S puts out. Without a shadow of a doubt, the Bentley will remain the car more inclined towards performance, but this isn’t a problem since it now knows how to be properly civilized and how to dampen any bump in the road in complete silence. This leads me to the all-important cabin. It really doesn’t matter how much oomph the engine makes, how stiff the chassis is or how small the panel gaps are (or how clever the hood ornament is) if the interior doesn’t match the ultra-luxurious aspirations of both of these legendary brands. Both of them will want to make a statement with the new models without shocking their client base. 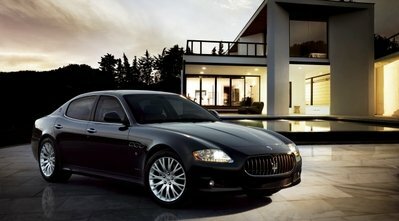 That’s why I wouldn’t expect broad changes in the cabin of the new Flying Spur - also because they aren’t needed. Autocar reported that the only thing the old Flying Spur would’ve used more of was front headroom and we won’t know if this issue has been addressed in the new model. Viewing the issue from a different angle, as long as you never drive the car yourself and you’re just driven around, you don’t really care about this aspect - it’s the chauffeur’s job to fit inside, hat included or not. Besides that, the old Flying Spur featured a gorgeous wraparound dashboard with two-tone leather and veneer sharing the space. Seemingly, almost 108 square feet of wood is used to manufacture the walnut burr veneer dash panels of each Flying Spur, and if you don’t like to hit Mother Nature that bad, you can choose from other six veneers. The V-8 S, for instance, comes in standard with sportier piano black veneer dash faces and the smaller three-spoke steering wheel (as well as the sizeable 20-inch rims on the outside for better road holding and extra bling). Expect to see similar attention to detail and tons of exquisite materials blended according to your preferences. The seats will most definitely be heated (and cooled) and will massage you to heaven and back. There will be, too, a touch of novelty thanks to the two digital screens, one behind the wheel for the gauge cluster and one in the middle that will act as the HQ of the infotainment system. Be sure Bentley’s new (and amazing) rotating display system, a collection of 12.3-inch digital screens housed in a three-sided unit that revolves in the center console. 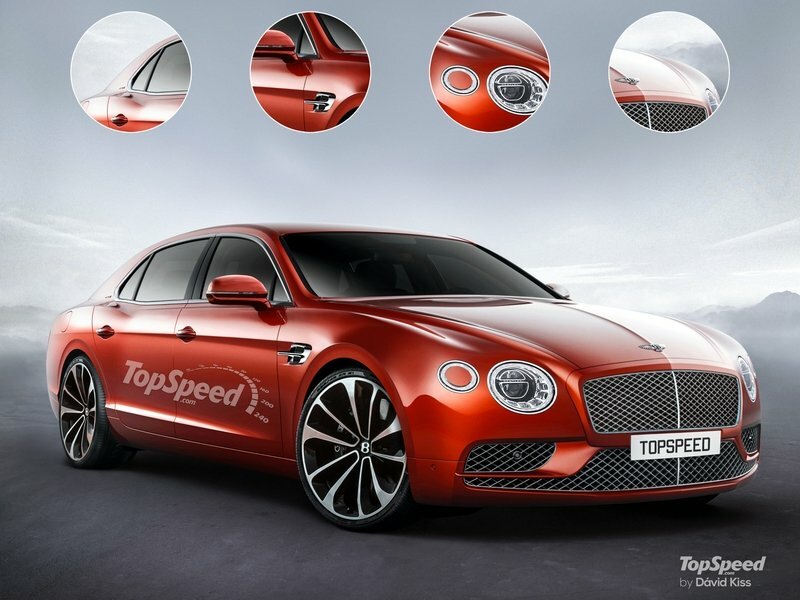 They will complement other high-tech safety features (everything from lane assist, traffic warning, 360-degree cameras to some sort of autonomous driving systems plus Apple CarPlay, real-time traffic, and Private eCall for emergency services) and stuff like LED taillights and, maybe, laser headlights - the Ghost will get’em so Bentley can’t lag behind. Talking about innovation and staying ahead of the curve, I've mentioned that this Flying Spur will be the last non-electrified Bentley but what I meant was that it's the last to also come with ICE-only versions. What comes next will be hybridized whether you like it or not. If you like it, the third-generation model will also get some sort of hybrid help, and this is something that Rolls-Royce has no answer for. Bentley’s first dip in the water of hybridization is happening right now with the [Bentayga Hybrid-art176990] that comes with a gas-powered, twin-turbocharged, V-6 that delivers 325 horsepower and 332 pound-feet of torque on its own. 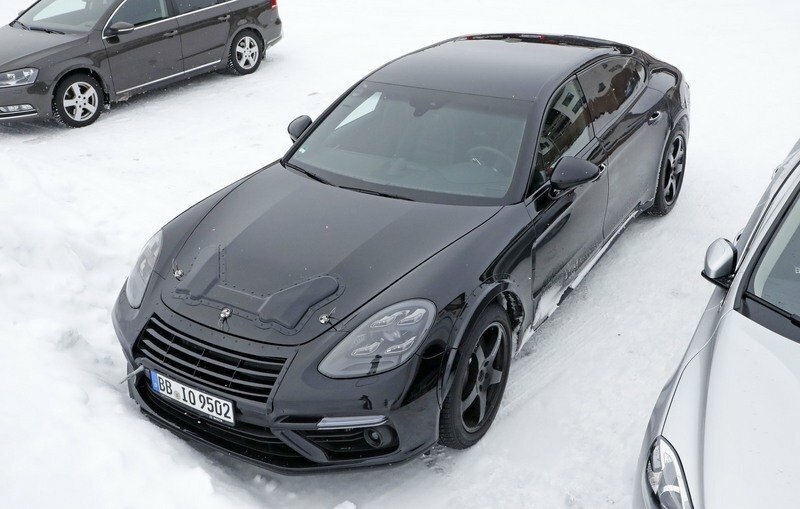 This engine, that’s also utilized by Porsche in the Panamera Hybrid, is aided by an electric motor that pulls double-duty as a generator. 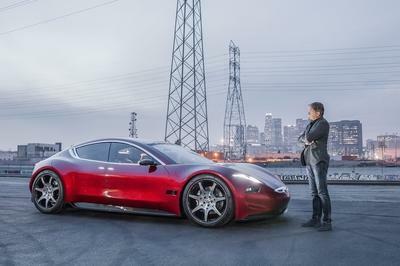 The electric motor generates 134 horses and 295 pound-feet of torque for a total output of 456 horsepower and 516 pound-feet. This is somewhat comparable (with a little bonus in the torque department) with the current Flying Spur V-8. In the Bentayga, the electric motor can go on its own for 31 miles, and it needs 7.5 hours to recharge via a domestic socket and under three hours if connected to a more powerful source like those in the EV charging stations. 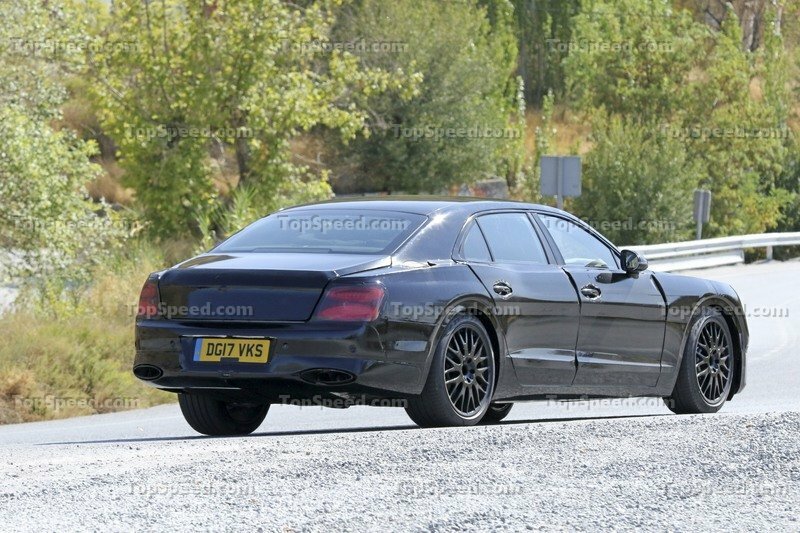 With the Flying Spur underpinned by the same MSB-F platform as the Panamera, I’d expect them to share the engine and other bits so those figures could stand. With this being said, Porsche offers the S-E Hybrid model that combines a turbocharged V-8 with the electric motor for a combined output of 671 horsepower and 627 pound-feet. I don’t think Bentley will aim for such insane figures though. 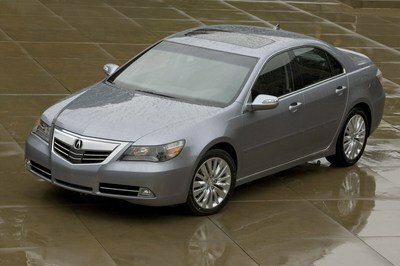 The Hybrid will probably be priced in between the V-8 and the W-12. 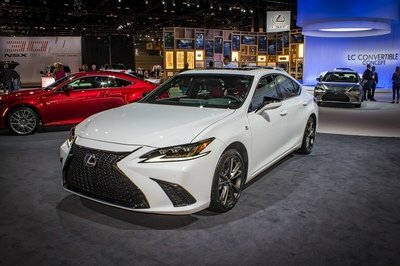 Expect the V-8 to tip just above $200,000 while the W-12 will have an MSRP of over $250,000 but this will still probably be less than a Ghost since the MSRP for a 2019 Ghost is $311,900 versus just $244,600 for a 2018 model year Flying Spur W-12 S. Granted, if you have this amount of money and you’re ready to dispose of it in exchange for a car, $40,000 won’t be a deal-breaker for you. It’s all about what suits your needs, your style, and what kind of image you want to display to the outside world. 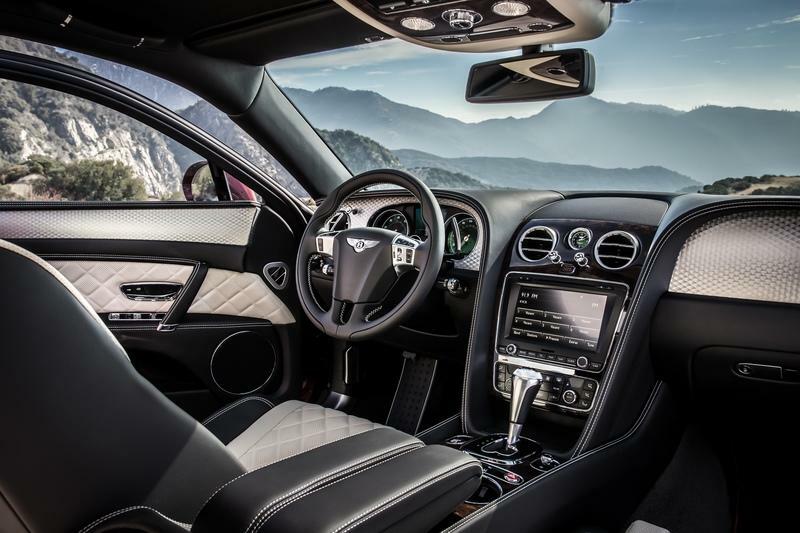 Read our full review on the 2017 Bentley Flying Spur V8 S.
Read our full review on the 2017 Bentley Flying Spur W12 S.